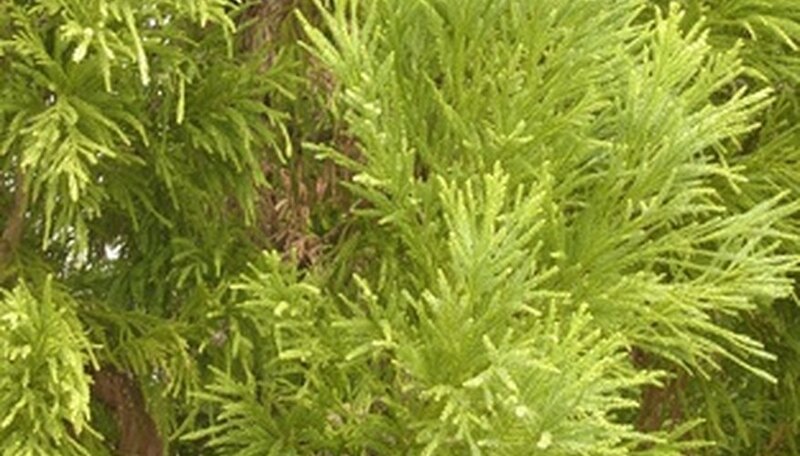 Cedar trees are popular evergreen trees that have a pleasant shape and are often used as screening trees. They can grow quite tall and require next to no maintenance once they are established. However, cedar trees play host to a several diseases that can destroy these trees over time. The best way to keep your cedars healthy for years to come is to know the signs and symptoms of cedar tree diseases on sight. Cedar-apple rust is caused by a fungal infection that spends part of its life on cedar trees and the other part of its life on apple or crab-apple trees. On a cedar tree, the fungus forms a large, woody gall on twigs and branches. While this may not kill the tree, it can cause brown foliage, distorted growth and leave the affected area prone to other infections. The galls should be removed from the tree by gloved hand and the tree can be sprayed with a fungicide to permanently break the disease cycle. Phytophthora is a fungal infection that was first reported in Seattle, Washington, in 1923, according to the U.S. Department of Agriculture. Trees that have a phytophthora infection appear as if they have been dowsed in water, then the wood will turn a dark, stained brown as the fungus moves through the roots and into the wood of the tree. Foliage will at first appear lighter in color, while the inner bark will dry out and darken. Often beetles attack the weakened tree, speeding the dying process. Phytophthora generally must be treated with pesticides to attempt to save the tree, or the plant can be removed to prevent spread of infection. Root rot first manifests in the form of wilting, browning leaves that appear to be lacking sufficient water even when water is available. In some cases, by removing affected foliage and making sure that adequate drainage is available in the soil, you may be able to save your tree if you fertilize it with a nitrogen fertilizer. However, in most cases, rotted roots cannot be restored to the extent that the tree will survive, and the cedar will have to be removed in order to prevent spread of the infection.